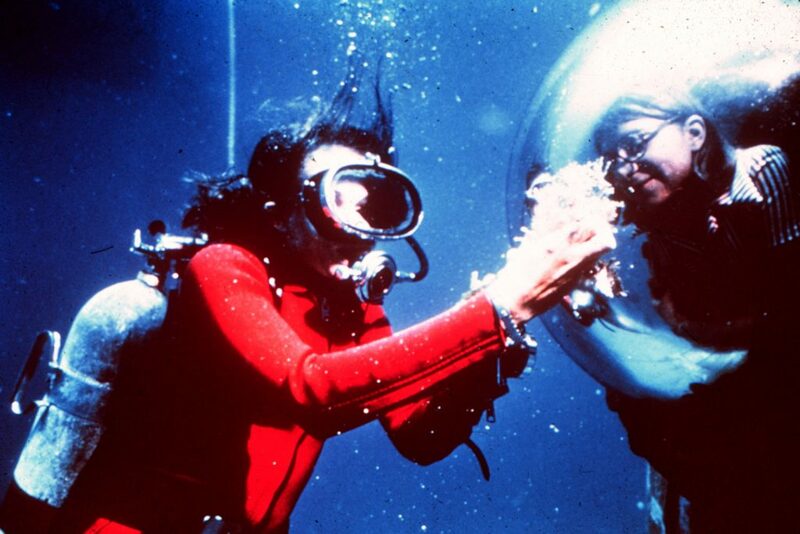 1970 — The Tektite II mission led by Dr. Sylvia Earle lasted two weeks at a depth of 15 m (50 ft) in the U.S. Virgin Islands’ Great Lameshur Bay. 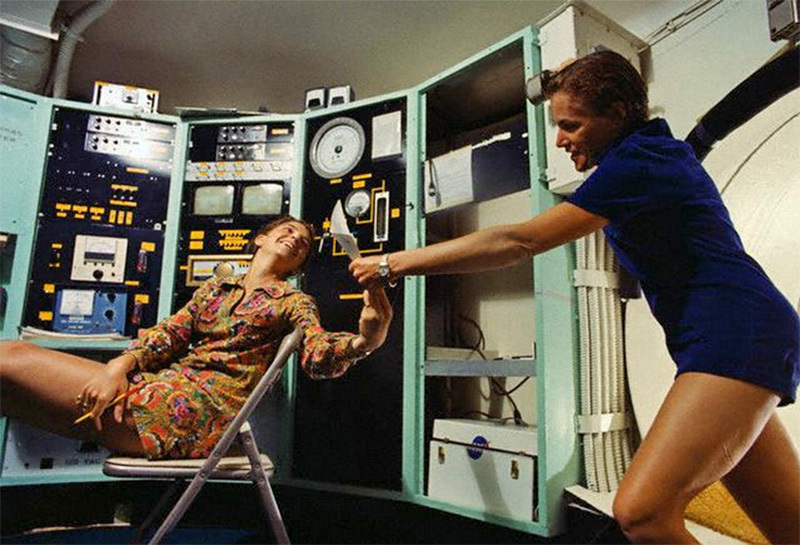 The team consisted of four scientists, Sylvia Earle, Renate True, Ann Hartline, Alina Szmant, and one engineer Peggy Ann Lucas. 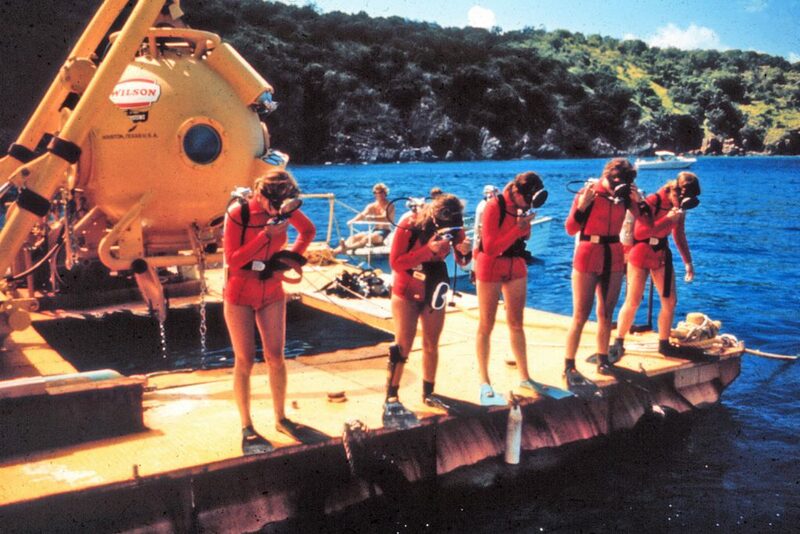 In addition to research conducted inside the habitat, the aquanauts spent up to 12 hours in the water each day. 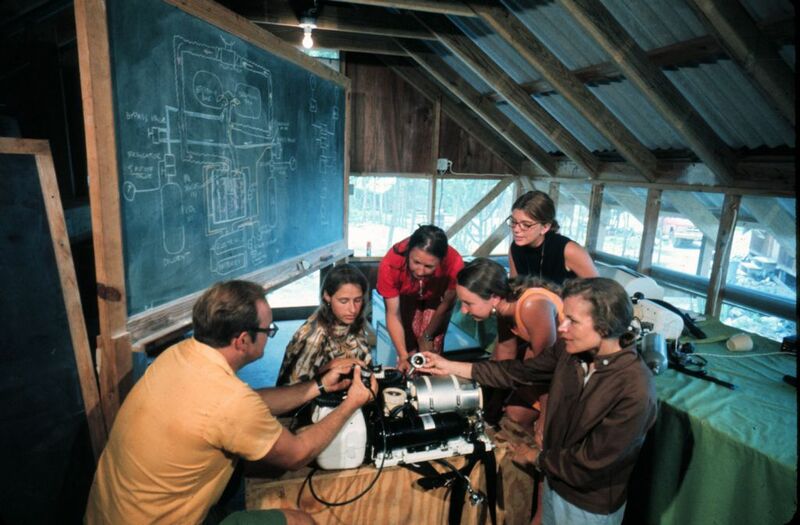 Research conducted by the aquanauts covered several topics, including decompression tables, the ecology of coral reef fishes, human physiology and psychology in extreme environments, and saturation diving. By living at a depth near that of the study sites, divers can operate for extended times in the water without having to undergo decompression between dives. 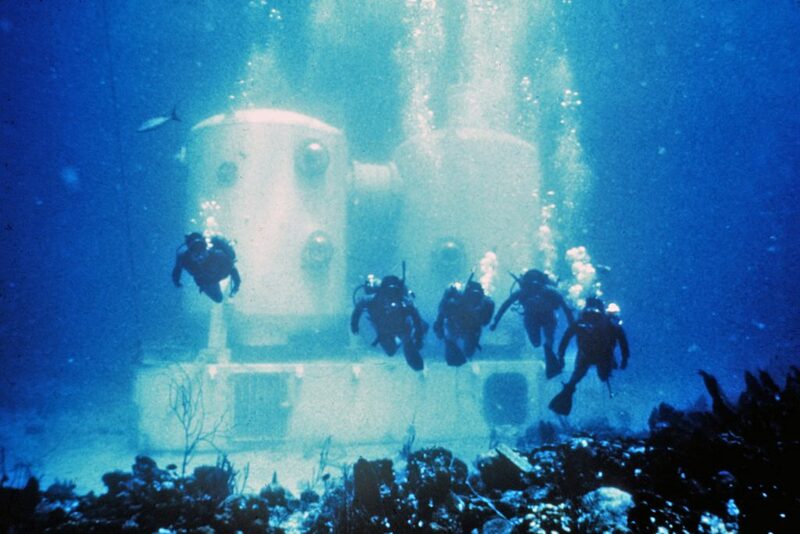 Only at the end of the entire mission do the divers undergo a single, extended decompression period to permit their safe return to surface pressure. Thus, the use of saturation diving allows researchers to spend vastly more time actually engaged in on-site, underwater work than can be accomplished by normal, surface-based bounce diving techniques. 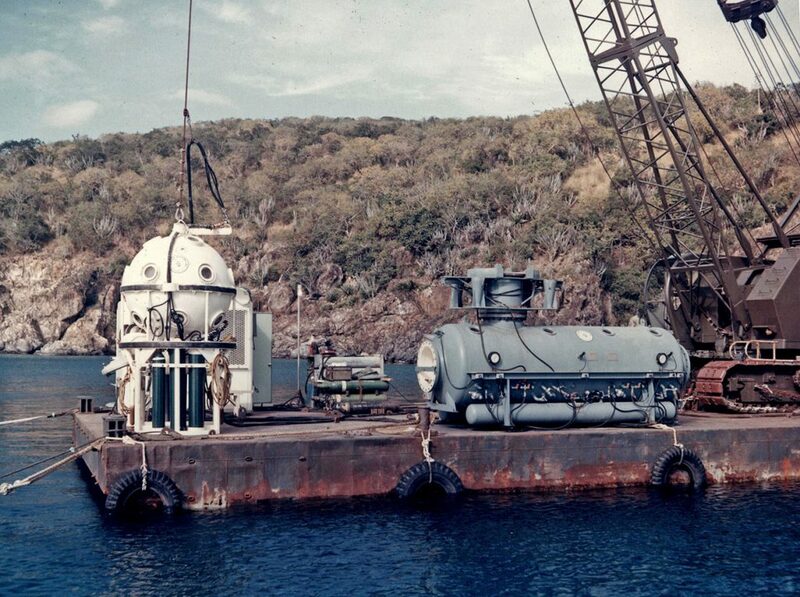 The Tektite II saturation diving program was conducted in the U.S. Virgin Islands from April to November, 1970. This program enabled 11 successive teams to conduct biological, physical and chemical studies in a tropical coral reef environment. Each team consisted of four scientist-divers and one engineer-diver to manage the support systems of the Tektite habitat. Divers lived in the habitat at a depth of about 50 feet (15 m) which allowed unlimited working time within a depth range of 25 to 65 feet (7.6 m to 20 m). The shallow limit was the physiological minimal safe excursion depth for divers saturated at 50 feet (15 m). The deeper limit was simply the greatest depth that could be reached within reasonable swimming distance from the Tektite habitat. The physiological lower depth limit was established at 100 feet (30 m). 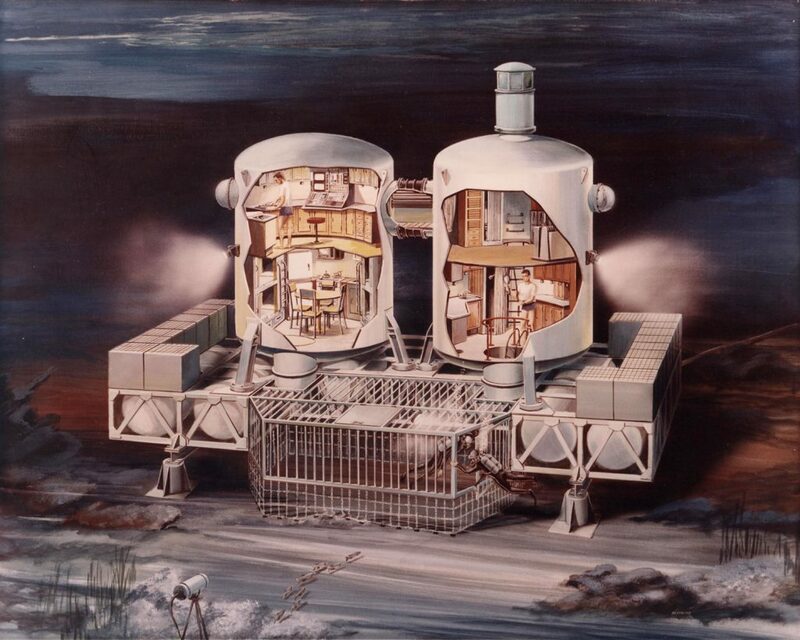 The Tektite habitat was supplied with air, electricity, water and communications via an umbilical running from a constantly manned control station ashore several hundred feet from the habitat. During all scuba-equipped excursions away from the habitat, divers were followed by a safety team in a skiff overhead. The total decompression time required following saturation in the Tektite habitat was approximately 20 hours and was carried out in a surface decompression chamber after transfer of the divers from 25-feet (7.6 m) depth to the surface chamber in a pressurized personnel transfer capsule. BB Collette. RESULTS OF THE TEKTITE PROGRAM: ECOLOGY OF CORAL-REEF FISHES. In: MA Lang, CC Baldwin (Eds.) The Diving for Science…1996, “Methods and Techniques of Underwater Research”, Proceedings of the American Academy of Underwater Sciences Sixteenth Annual Scientific Diving Symposium, Smithsonian Institution, Washington, DC.